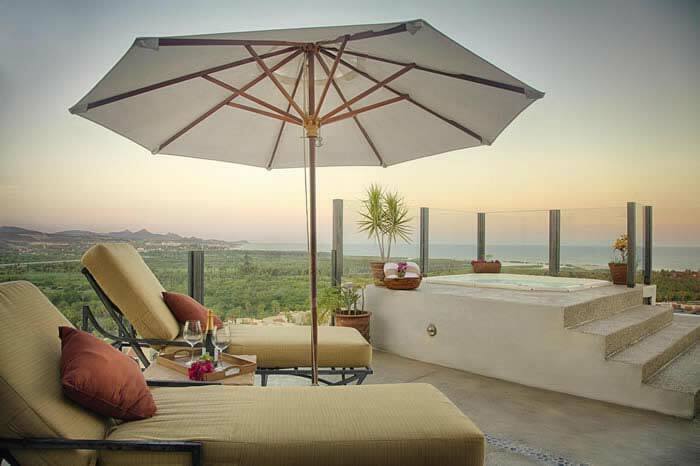 Alegranza is LuxLife’s best recommendation for long or short term Cabo vacation rentals in San Jose del Cabo. Enjoy a family vacation, a relaxing break, or romantic getaway at the impressive Alegranza Los Cabos. This delightful resort is noted for its luxury finishes, warm service, high-end amenities, and superb location. With top-of-the-line kitchen appliances, ample terraces, luxurious bedroom suites, and endless views overlooking the blue waters of the Sea of Cortez; Alegranza offers a wide variety of fully furnished condominiums, from 2 and 3 bedroom suites to double-floor penthouses, ranging from 2,010 to 3,200 sq. ft.
Bar & Grill with room service. Full fitness center with saunas. Crystal clear saline swimming pools. 24 hour concierge and security service. All the comforts of home in a Baja paradise where the desert meets the sea. For those wishing to experience the lifestyle possible in Baja, Alegranza offers the perfect setting, with impeccable architecture, pool, hot tub, tennis courts, and access to two partner beach clubs nearby. Private, and ideal for families with children and pets, Alegranza allows you to experience the culture of San Jose del Cabo at its fullest. Close to El Centro, and the Historic Art District, as well as the incredible beaches along the Sea of Cortez. The San Jose Estuary brings you closer to nature, with its variety of sea birds and other indigenous wildlife. Rental rates at Alegranza include accommodations only (European Plan). Alegranza’s only on property restaurant is the award winning Casiano’s Restaurant, located below the pool area, for out of this world fine dining. Nearby grocery stores and markets provide all the ingredients for healthy eating at home. Since each apartment is self contained, offering fully appointed kitchens, many opt to prepare meals at home, or have a private chef prepare their meals. Other restaurants in the area within easy walking distance, include Habañeros, Mi Ensalada, and casual fish tacos at Claros Junior on Mijares. A little further toward El Centro are a vast variety of restaurants featuring local and international menus, and all price ranges. Ask your luxlifevacations.com Concierge for the best restaurant options in the area to fit your mood, appetite, style and budget. Home in Baja…The FANCY Style is all about quality and exceeding guest expectations. From the resort culture and architecture, to food design, drinks and service, you receive the best of everything… Amazing moments, music, meals and other memorable experiences. Quiet, comfortable and a home away from home, Alegranza provides the perfect setting for rest and recharging your batteries, reading or writing that next book, or just getting away from inclement weather up north. The concierge can explain options for activities, restaurants, clubs and events, and make all necessary arrangements for you to enjoy your stay to the fullest. Wake up to incredible sunrises, fabulous vistas of the Sea of Cortez, and a variety of indigenous birds from the nearby estuary. Alegranza has no direct access to a beach. But they do have agreements with two beach clubs in the area for their guests: At El Ganzo Beach Club, minimum consumption is required. They provide you with lounges, shades and chairs, and the beach is swimmable all year around. The second option is at Barcelo. Since it is an all inclusive option, they charge $75 USD for an adult per day, and is ¨all inclusive¨- drinks, food buffet, chairs, lounges & towels are provided. The closest walkable beach is about a 15 minute walk, and is perfect for walking and exploring. However, you must know it is not a swimmable beach. This is for your own safety as the currents and undertow may be strong and unpredictable. This factor should not detract from your enjoyment and safety, as Alegranza provides a trio of gorgeous swimming pools, with plenty of comfortable beds and loungers. Other water activities are nearby, and can be arranged through your concierge. Swimmable beaches, Palmilla, Ganzo, Playa Santa Maria and Playa Chileno Bay are a short distance by car. . This 2,010 sq ft residence features spacious indoor-outdoor living with an expansive ocean views from every room to enjoy the sunrise and great ocean breezes while sipping on your morning coffee. Enjoy of an outside meal or just lounge in your wide and private terrace and enjoy the unforgettable views of the estuary, golf fairways, Palmilla bay, Punta Gorda and Puerto Los Cabos marina. This 2,140 sq ft residence is perfect for a vacation in Cabo with friends or a family. This residence has two bedrooms with amazing views of Punta Gorda, the estuary, golf fairways, Puerto Los Cabos marina and Palmilla. The third bedroom has views to downtown and the protected area of Sierra de La Laguna Mountains. The residence is featuring 3 full bathrooms, with a superb hot tub in the master bathroom. It also boasts a fully equipped kitchen, 10 ft ceilings, granite countertops, Alder wood carpentry, purified water, wireless internet and double pain window providing complete noise and temperature isolation. This three bedroom, two level penthouse will embrace you from the moment you step through the front door and take in the breath-taking views of the Sea of Cortez, San Jose estuary, golf fairways, Puerto Los Cabos marina and Palmilla bay. Soak away your worries in your private Jacuzzi on the expansive roof-top terrace (1,000 sq ft of outdoor living), and entertain your friends in style. Relax after a long day enjoying fishing, beaches or golf in this magnificent residence. Alegranza’s unique Double-floor Penthouse, comes with a fourth bedroom and full bathroom in the roof-top terrace. Top of the line appliances and high-end finishes and furnishings ensure your complete comfort in incomparable style. Your private roof-top terrace is perfect for entertaining, with a private Jacuzzi, built in BBQ, lounge area and outside shower. This spacious residence, ideal for large families and groups, offers amazing 270 degree views to the spectacular Sea of Cortez, fairway views, Palmilla, the estuary and the beautiful Baja desert. Spectacularly located on a ridge, high above the Vidanta Golf Course, and the rest of San Jose del Cabo, Alegranza residences enjoy endless views of the nearby Estuary, the Sea of Cortez, and the picturesque town. A short walking distance to either the beach or El Centro, and San Jose’s Historic Art District, as well as shopping, restaurants, and hospitals. Alegranza has partnered with local spas to provide the best options for their guests. Many full service spas, salons, and other services can keep you looking and feeling your best. Alegranza’s fitness centre with gym and workout room and tennis courts will keep you active and fit. Alegranza welcomes singles, couples, families and their pets, for both short and long term rentals, and full ownership options. Featuring a Pool area with hot tub, Fitness Center with Gym & Workout Room, and Tennis Court. Restaurant Bar/Lounge Offering Free Parking, Concierge and Multilingual Staff. There is also a Business Center with Internet Access, conference facilities, and Meeting Rooms available. Children’s Activities & Babysitting available. In addition Airport Transportation, Dry Cleaning, Laundry Service and Self-Serve Laundry. Overlooking the fairways of San Jose del Cabo’s Vidanta Golf Course, Alegranza is just a couple of minutes away from the Pro Shop. Other nearby courses include Campestre, and the courses at Puerto Los Cabos. Continental breakfast and daily maid service is included. Please, ensure to bring a valid Credit Card, since at check-in we need to open a voucher and have a pre-authorization of $300-500 usd, which will be released after checkout if property and balance is in order. Each residence is fully furnished and equipped, with brand new appliances, top of the line furniture, plasma TV’s, towels, beddings, kitchen tools and cooking set. Cancellation policy: Full refund 60 days before the arrival date, 50% refund 31-59 days before the arrival date and no refund 30 days before the arrival date. The Ridge Resort at Playa Grande is an exceptional resort perfect for families, couples and travelers looking for quality at the VIP touch on a budget.